These two have many similarities: They were both born in 1987, they share the same middle name (Alexander), both of their fathers are engineers and they are both starring in That Awkward Moment — out this week! Who do you think is hotter? Zachary David Alexander Efron was born Oct. 18, 1987 in San Luis Obispo, California. His father was an electrical engineer and his mother was a secretary who worked at the same power plant. After guest-starring on several television series, he got his big break in 2006 starring in the Disney Channel’s original movie High School Musical. Miles Alexander Teller was born Feb. 20, 1987 in Downingtown, Pennsylvania. He lived a nomadic childhood due to his father’s career as a nuclear plant engineer. He appeared in the stage musical Footloose, which led to him being cast in the film remake. In 2009, he made his television debut playing James Boorland in the dark comedy The Unusuals on ABC. Zac Efron: Efron was nominated for a Young Artist Award for his performance in Lifetime’s Miracle Run, where he played one of two autistic twins. Since then, he’s won numerous Teen Choice Awards and MTV Movie Awards. In 2008, he was listed as #92 on the Forbes Celebrity 100 list. He has dabbled in animated movies (he voiced Ted Wiggins in The Lorax), period dramas (he played Richard Samuels in Me and Orson Welles) and proved his musical theater chops after being ridiculed for being dubbed in High School Musical by doing all of his own singing as Link Larkin in Hairspray. Miles Teller: Teller gained recognition for his performance in the 2010 film Rabbit Hole. Since then, he’s been landing roles in a variety of mainstream and independent films. Last year, he won the Dramatic Special Jury Award for Acting for his work in the film The Spectacular Now. He attended the premiere of Whiplash at the Sundance Film Festival this month and is attached to portray Dan Aykroyd in the untitled John Belushi Project. Zac Efron: Efron works with celebrity trainer Ramona Braganza, who created a 321 method for her clients, allowing them to effectively work out while on location during filming. The method focuses on cardio, circuit training and core work. Miles Teller: He practiced Muay Thai when he was younger. Zac Efron: He supports the American Humane Association, Habitat For Humanity and the Make-A-Wish Foundation, among other charities. Zac Efron: He has an Australian Shepherd named Puppy. Miles Teller: No pets at this time. Zac Efron: Efron graduated from Arroyo Grande High School and was accepted into USC, but deferred his enrollment to continue acting. Miles Teller: He graduated from Lecanto High School and earned a Bachelor of Fine Arts from Tisch School of the Arts at NYU. Zac Efron: He dated Vanessa Hudgens from 2005 to 2010 and has been on and off with Lily Collins since February 2012, but claims he is currently single. 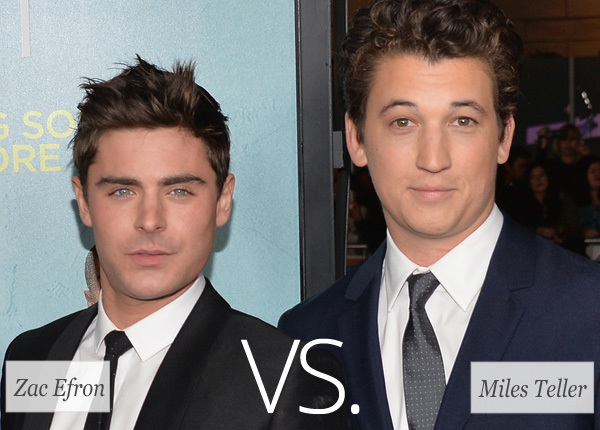 Miles Teller: It’s hard to find facts on this boy’s previous relationships. Although currently single, it was rumored he was dating his The Spectacular Now co-star, Shailene Woodley.